Everything you need to know about yellow diamonds. 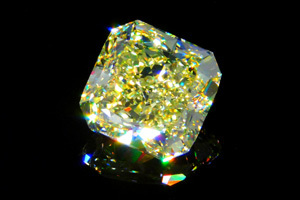 Yellow diamonds are graded on a 9 color intensity and tonality scale. However, there are only 4 grades within this scale that are considered desirable colors for yellow diamond jewelry. The color grade can be thought of on a linear scale where you have low color saturation on the left side and as you move toward the right side the saturation increases and the diamond appears more yellow. 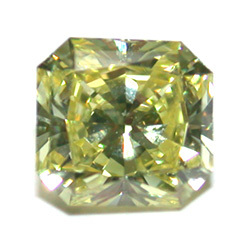 There is no single color in the spectrum that perfectly represents a Fancy Yellow graded diamond. In the above color graph we have placed lines as boundaries between the color grades, in reality the boundries are not as clear. 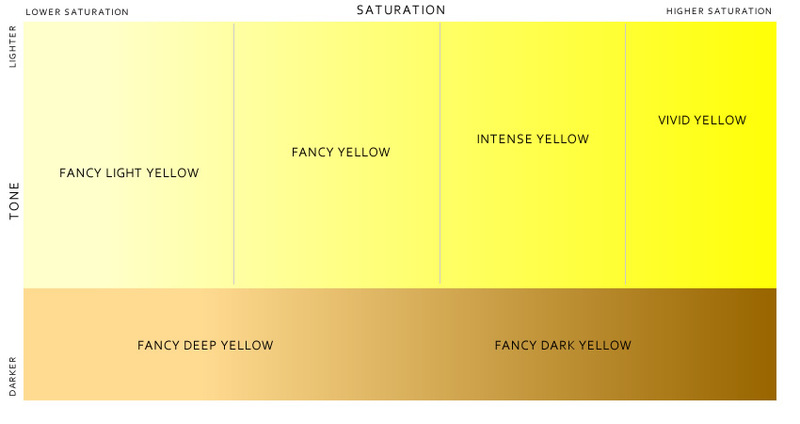 In other words the very best Fancy Yellow diamond is virtually indistinguishable from the lowest example of an Intense Yellow, the same way the lowest Fancy Yellow would be identical to the best Fancy Light Yellow. This is where both experience and expertise play a vital role in evaluation. Getting the basics from the GIA report is just the first step in the process of evaluating a yellow diamond. Yellow Diamonds are cut into every imaginable shape but they are not by any means equal. The ideal in a yellow diamond (this is also true for any fancy colored diamond) is to achieve the perfect balance between the maximum possible depth and saturation of the color while maximizing the Brilliance, Fire and Scintillation of the diamond to the highest degree possible. Since the return of white light and the dispersion of light back towards the human eye have a negating effect on how we percieve the body color of the diamond these two goals are somewhat at odds with one another. 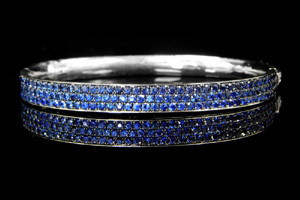 It is only by the hand and skill of a master diamond cutter that a delicate balance is struck between these opposing forces of optics and that stunning examples of diamonds of every shape and color are created. Since the different shapes of diamonds have very different faceting systems there are some major differences in the frequency and value of differently shaped yellow diamonds, even when they are the same color grade. 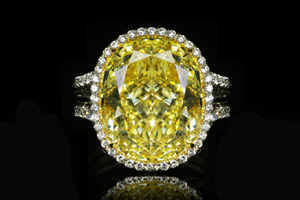 The vast majority of yellow diamonds and in fact of all fancy color diamonds are cut to Radiant shape. The Radiant cut faceting maximizes the saturation of color in the diamond (where the value of the diamond comes from) while maintaining the highest levels of Brilliance and Fire possible, the 'Life' of the stone. 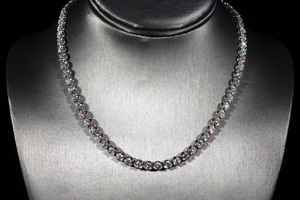 It is the combination of these two traits that give diamonds their sparkle and combined with the depth and tone of the color, make yellow diamonds visually attractive and valuable. The Radiant cut is available in square to rectangular shape and is a great choice for a yellow diamond. The Cushion cut is very similar to the Radiant cut in regards to how the faceting system and shape of the stone balance the most vibrant color possible with highest Brilliance achievable. 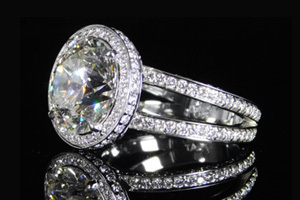 This is why it is the second most popular cut for fancy diamonds. The main difference visual between the Cushion and the Radiant are the softer, rounded edges of the Cushion shape. 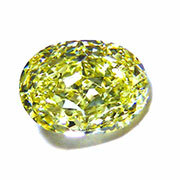 There are several variations of the Cushion shape, in most cases Cushion cuts make for stunning yellow diamonds. 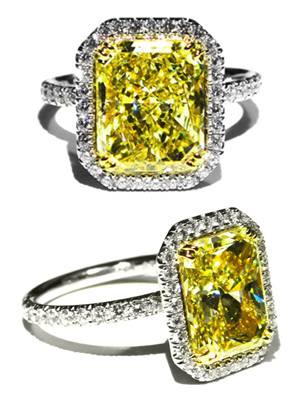 Cushion cut yellow diamonds can vary from square to rectangular and are a great choice for a yellow diamond. Emerald cuts employ a step-cut faceting system. 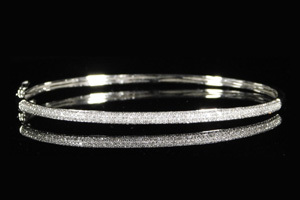 This system of long, broad facets maximize the return of white light or Brilliance and deeply interfere with the perception of body color in a diamond. 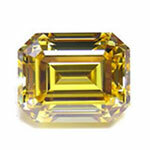 For that reason Emerald cut yellow diamonds are infrequent at best. When a yellow diamond is cut to Emerald shape the diamond will often command a large premium over similar Radiant or Cushion shapes. The Asscher cut is very similar to the Emerald cut and while it is not the ideal shape for a yellow diamond it can be a stunningly beautiful option. For those that find the repeating pattern of concentric squares created by the Asscher diamond's unique faceting mesmerizing, the Asscher holds it's own in the fancy color diamond shape comparison. The Oval Brilliant cut yellow diamond can be amazing in terms of their color retention/color display coupled with high levels of Brilliance and Fire but the Oval can also be problematic because of it's oblong and asymmetrical shape. 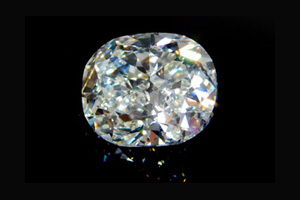 In many cases the Oval cut will exhibit what we refer to as a 'bow-tie' and while this might sound nice, what it actually describes is a dark/light area in the center of the diamond that is either black or without color, either way an unattractive feature that should be avoided. An Oval must be examined visually to determine the extent of the bow-tie. Extremely well proportioned Ovals can minimize or virtually eliminate the bow-tie. While the Princess cut can make for an attractive shape in colorless diamonds, it is rare to find a good looking Princess cut in a yellow diamond. The faceting pattern of the Princess negates the color of the stone and the result is often a washed out and unattractive yellow diamond. The sharp pointed edges of the Princess are also very delicate and can present problems when mounting in a ring. If you are interested in a square shaped yellow diamond we recommend that you consider a square Radiant cut instead or if a Princess is a must be prepared to take your time until you find that one in a million yellow Princess.. The pear shape is a distinct variation on the Oval and as such has the potential for very high Brilliance and 'Life' in the stone while retaining and showing off excellent color saturation. Like all asymmetrically shaped diamonds a visual inspection is required to determine the extent of 'bow-tie' present in the diamond. 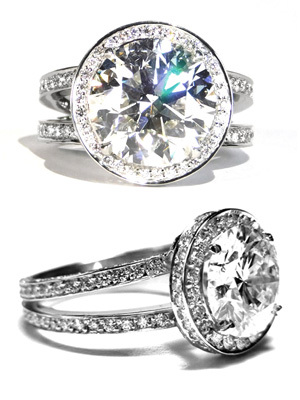 The Round Brilliant cut diamond is by far the most Brilliant of all the diamond cuts. For over 100 years diamond cutters have been studying the percision optics involved in maximizing the return of light from this shape diamond. The good news is that they have succeeded. The bad news is also that they have succeeded. 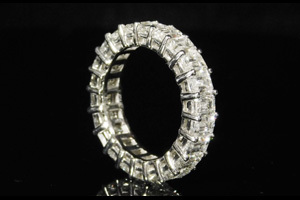 The Round Brilliant shape is so brilliant that the body color of the diamond is to a large extent negated and more frequently than not Round Brilliant cut yellow diamonds appear washed out and poorly proportioned in a desperate attempt to find the proper balance between color and brilliance. 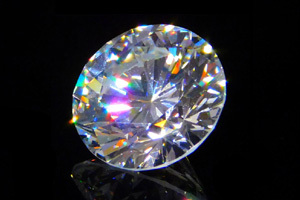 There are exceptions, some diamonds have such rich body color that they can successfuly be formed to the Round Brilliant shape and appear to hold their body color. These stones are rare indeed and you should expect to pay a very high premium for a Round Brilliant shaped yellow diamond. 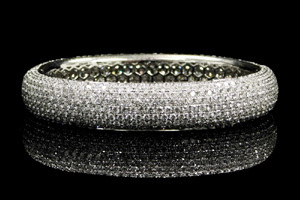 Are yellow diamonds more expensive than colorless diamonds? 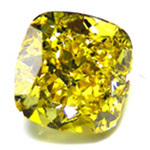 Yellow diamonds are considerably more rare than colorless diamonds. Yet even so yellow diamonds are generally priced much more attractively than colorless diamonds with certain exceptions to this rule. 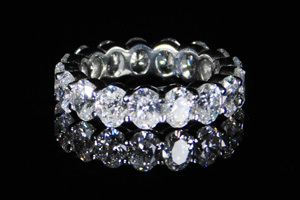 It is important to note that colorless diamonds base their value on the combination of weight, color and clarity. Yellow diamonds base their value on weight and color and to a more obscure degree the quality of the proportioning or Cut of the stone (within the range of VVS1 - VS2 clarities, Internally Flawless yellow diamonds usually command small premiums because of the associated "bragging rights" of the Internally Flawless grade, which by the way has zero impact on the visual quality of the diamond). So esentially the Clarity of a yellow diamond graded between Internally Flawless and VS2 has little or no impact on the value of the diamond. This rule holds true for all natural fancy color diamonds. However, yellow diamonds with a clarity grade of SI1 or lower should trade at a discount compared to the higher level clarity grades. How much lower will depend on the actual clarity grade, for example an eye clean SI1 will suffer just a small discount in value while an SI2 or an I1 with eye visible inclusions should be discounted substantially from the higher clarity grades. The next thing to take into account is that there are various grades within the colorless diamond sceme and also within yellow diamonds. 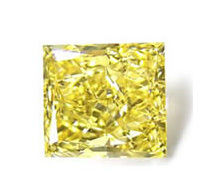 If we were to compare a Fancy Light Yellow diamond to a D color Internally Flawless colorless diamond the yellow diamond will seem very inexpensive. 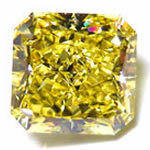 But this would be just one expression of both colorless and yellow diamond values and hardly a meaningful comparison to base any generalizations regarding price on as the Fancy Light Yellow diamond represents the most common and least expensive example of a yellow diamond while the D color Internally Flawless the most expensive form of the colorless diamond. As we increase the color grade of the yellow from Fancy Light Yellow to Fancy Yellow, Intense Yellow and Vivid Yellow the price of the yellow diamond increases and the gap between the values of the yellow diamond and the colorless diamond will become smaller and smaller. 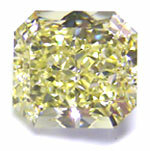 Certain shapes of diamonds are more rare than others in yellow diamonds. 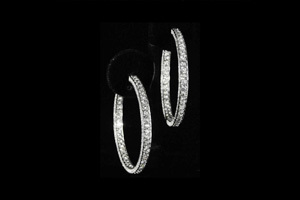 The most common shapes to find are the Radiant and Cushion followed by the Oval and Pear shapes. Round Brilliant, Emerald and Princess cuts are far more rare. 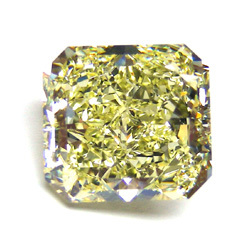 The reason for this disparity is that the nature, the geometry and optics of these shapes does not present very well in terms of maximizing the body color of a colored diamond.The high Brilliance of the Round Brilliant and the step cut faceting of the Emerald cut will detract from the percieved color of the diamond in many cases. Since the intensity of the color is where virtually all the value of that diamond comes from, most diamond cutters will choose the Radiant or Cushion shapes the majority of the time. However, in rare and outstanding cases when the rough diamond has a special quality, the rare Round Brilliant, Emerald or Princess may appear. You can expect to pay significant premiums for these shapes for any given color grade over similarly sized and colored Radiant or Cushion cuts. 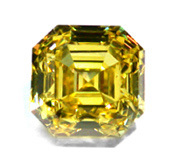 Below are some examples of seemingly similar yellow diamonds. Reading the specification of the accompanying GIA reports one would think that these two diamonds are virtually identical in quality and as it would naturally follow, also in price. 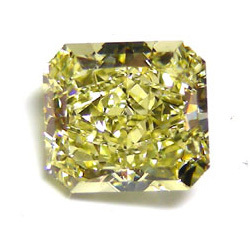 Both diamonds are graded as Fancy Yellow, have high Clarity grades, the proper sets of proportions that one would expect to see for a Radiant cut and both are Fluorescence free. However to a trained and experienced yellow diamond expert it is immediately and abundantly clear that one of these diamonds is superior to the other. While there is a small variation between the two Fancy Yellow colors it is the shape that makes a world of difference in this case. The 1.49 is a beautifully shaped Radiant cut and the 1.51 is ...less than that. The problem with this 1.51 are the disproportionately large clipped corners, which give what should have been a Square Radiant cut, an Octogonal shape. It is also interesting to note that the 1.51 was graded as Internally Flawless, a nice little feather in the cap for a yellow diamond and even so was still being offered at a discount from 1.49 (VS1) because of the shape. It might have seemed like a really good deal on paper...right up until you got a look at the actual diamond. Once again we have two diamonds that are very similar on paper, both Radiant cuts, both Fancy yellow, high Clarity and no Fluorescence with good proportions. Should these two diamonds with similar characteristics sell for similar prices? The determining factor in the case of the 2.17 is of course the dark area in the middle of the Table. It is clearly darker than the rest of the stone and appears to be devoid of both color and brilliance. Yet the GIA report boldly declares that the Distribution (of color) is "Even" and there is no mention of this dark area. 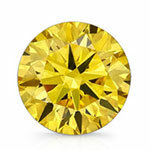 The valuation of yellow diamonds is not as simple as just looking at the color and the size. There are many other factors that go into the valuation of each yellow diamond on a case by case basis. It is important to have a grading report which provides you with the basic technical information regarding the stone and gives you a ballpark approximation of what you can expect from this diamond but it is by no means an infallable source of absolute truth and each and every diamond should be considered based on it's actual visual characteristics. The lesson to be taken from this is that the value or price of a yellow diamond is determined by a variety of factors beyond the defined characteristics from the grading report. Differences in the shape, the clarity, the proportioning and most importantly the color will have an effect on the value of a yellow diamond. 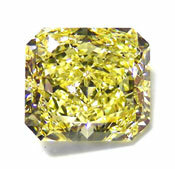 Radiant and Cushion cuts are the most common cuts for yellow diamonds. These shapes easily lend themselves to create an optically balanced gemstone that maintains a saturate body color together with high levels of brilliance, fire and scintillation. Radiant and Cushion cut yellow diamonds are available in a variety of shapes that vary from perfect squares to long rectangles. 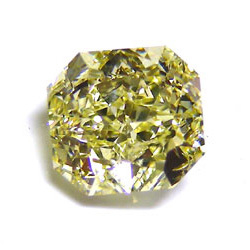 Oval and Pear Brilliants are also beautiful yellow diamond shapes but special attention must be paid to the proportioning in order to avoid 'bow-ties'. Emerald and Asscher cuts are far less common than other shapes and will command high premiums. Round Brilliant and Princess cuts do not easily retain body color. If an attractive diamond is produced in one of these shapes you can expect to pay high premiums for them. Shop our inventory of natural GIA certified Yellow diamonds with our Yellow Diamond Search page.